U.S. energy consumption is expected to grow 50% percent by 2030 and biofuels must continue to play a significant role to diversify our nation's energy sources. 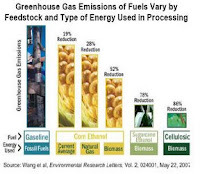 As biofuel critics look to derail the efforts for developing renewable fuels, the US Department of Energy has prepared a new fact sheet that dispels a number of myths that keep being repeated. The full report is available online HERE (pdf). MYTH: In terms of emissions, biofuels emit the same amount as gasoline or more. FACT: Biofuels burn cleaner than gasoline, resulting in fewer greenhouse gas emissions, and are fully biodegradable, unlike some fuel additives. MYTH: Ethanol cannot be produced from corn in large enough quantities to make a real difference without disrupting food and feed supplies. FACT: Corn-based ethanol is only one source of biofuel. As we address the technical hurdles associated with the efficient and cost-effective production of biofuels, ethanol will increasingly play a more significant role. MYTH: Ethanol gasoline blends can lower fuel economy and may harm your engine. FACT: Ethanol blends in use today have little impact on fuel economy or vehicle performance. 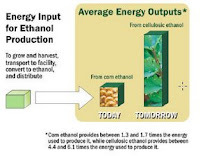 MYTH: More energy goes into producing ethanol than it delivers as a fuel. FACT: Each gallon of corn ethanol today delivers as much as 67% more energy than is used to produce it. Do I Have a Flex Fuel Vehicle? Great site! It's always good to get the straight scoop on biofuels. I've added you to my blogroll, check my blog out if you have time. I cover a wide range of topics; but oil, biofuels and agriculture are main staples.